With roots that span back many years, Building Additions is a Frome based company specialising in manufacturing folding partitions for various environments. Commercial Partitions: Commercial properties require as much space as possible to ensure efficiency, cost effectiveness and utmost organisation. Choosing to have a commercial folding partition can benefit all kinds of businesses and organisations. Movable & operable walls are available for those seeking an impressive finish and enhanced acoustics, multifold partitions for areas with limitations, concertina partition doors for an ideal solution for nurseries and pre-schools, and wood partitions with a versatility making it perfect for commercial and domestic environments. Operable Walls & Movable Walls: Working environments that need to make the most of its space such as offices, schools, colleges, universities and hotels benefit greatly from operable and movable walls. It still boasts the advantages of permanent partitions, but with the added bonus of being able to be put away when not needed. Multifold Partitions: These are hinged panels that are suitable for restricted ceilings or for where layout changes may be needed. They work most effectively in offices, meetings rooms, function rooms and leisure buildings such as restaurants and so on. Fabric Concertina Partitions: Just like the rest of our range, fabric partitions are inexpensive as well as creating a divide in a room rapidly and easily. It’s most popular for use in schools and nurseries. It being made of fabric with a coating means it’s washable and resistant to bacteria and other unwanted inconveniences, so it’s no wonder it’s used widely in hospitals and other medical environments. Wood Sliding Partitions: Aesthetically pleasing, these timber panels are great for offices, sport clubs or more domesticated environments such as care homes or even private homes. When not used, they are stacked away with ease and can be used in all kinds of rooms. Our Service & Repair: Our partitions and walls guarantee longevity, with servicing and maintenance provided by us to keep them that way. Our service to you stretches to servicing at a time that suits you most and aims to prevent any problems from happening. Repairs are done swiftly by trained staff. We have opened up our repairs and faulty parts replacement services for everyone to use. Other services, including consultations, surveys and more are available. We have a stunning reputation, with BS EN ISO 9001:2000, ISO9001 Quality standard and ISO14001 Environmental standard accreditations. Folding partition specialist Building Additions has helped to transform the inside of Addiction Recovery Community (ARC) at Montague Hall, Hounslow, with the installation of six of its operable walls. Folding partition specialist Building Additions has helped to transform the inside of the Aisha Masjid & Islamic Centre in Reading with the installation of three of its multifold partitions. Building Additions, has recently installed an Operable Wall and Glass Folding Door system to provide adaptable hospitality space at Lifton Strawberry Fields Farm Shop, Devon. Folding walls from Building Additions have been installed at the brand new Cardiff City Stadium to provide the flexible space needed to maximise hospitality business. To mark its' tenth anniversary in business and a move to new premises, folding partitions specialists Building Additions has introduced a new corporate identity. Building Additions has just introduced a semi-automatic Electroglide model to its operable wall range for quick, effortless operation at the flick of a switch. 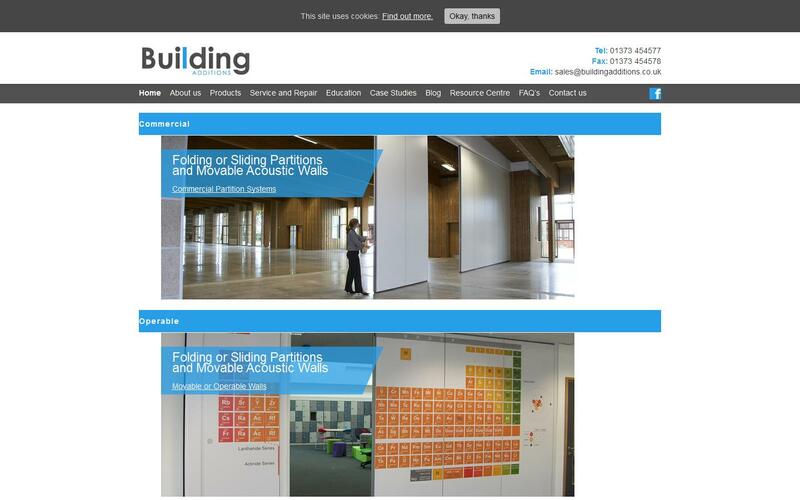 The new Building Additions website is now live with an evolved design tailored to inspire and inform those involved in specifying folding partitions. Woodlands Country Club have been able to maximize space, allowing for wedding receptions and conferences, by installing multifold partitions. Great company with good communication and work ethic.